One of the hardest things to do in life is to discover the place, feeling, or person who helps get you centered and on the right path. Sarah hopes her move to Maine is just the thing her dysfunctional life needs. Within hours of arriving, she befriends a dog and makes an enemy of Hank, a man going down the wrong path. Over the next few years, Sarah finds the friends she wanted and the family she’d longed for. Thomas Block (1951-2017), artist/illustrator, was named “Art Educator of the Year” in 2001. Thomas also created fine art pieces in Tempera Resist, Egg Tempera, watercolor and a variety of drawing mediums. He exhibited at many local venues such as River Arts Gallery,BRAF, Pemaquid Art Gallery, Maine Art Gallery, USM Art Gallery as well as Trinity College and Savannah College of Art and Design. The Boothbay Register/ Wiscasset Newspaper awarded Thomas Block “Artist of the Year 2014” recognition. 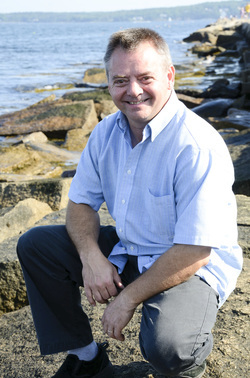 Steven D. Powell is a lifelong resident of mid-coast Maine, where he lives with his wife, Linda. They have two adult children, Amanda and Alex. 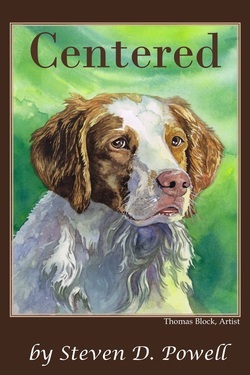 Centered is his second novel. His first novel, Patch Scratching, was released in 2011.